The graph of a function y = f(x) may be plotted using Differential Calculus. Consider the graph shown below. 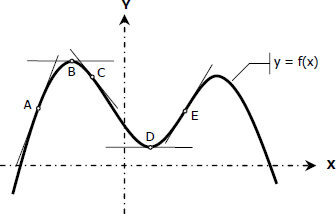 As x increases, the curve rises if the slope is positive, as of arc AB; it falls if the slope is negative, as of arc BC.